So I'm occasionally a fan of eggplant (depending on how it's cut and cooked), and I like tomatoes, and I like feta cheese. Red bell peppers and mint? Not so much. Still, I decided to try this recipe...and I wasn't surprised that a few bites of it was all I could stand before I tossed the rest. It's pretty simple to make, at least. Onions and bell peppers are sauteed with garlic, fennel seeds, and oregano. The spices make this oh-so-fragrant and aromatic, but it still doesn't do much in the end. 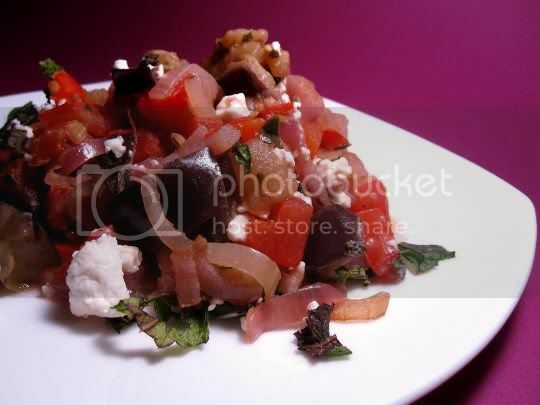 Next, diced eggplant is sauteed and added to the onion-pepper mixture, along with diced tomatoes. All of this is baked in a casserole dish (the 7x11-inch dish I used wasn't quite big enough) or Dutch oven, then topped with feta and freshly chopped mint. And let me tell you, the feta didn't even save this. The flavor of bell peppers is sooooo ridiculously overwhelming, that unless you're a fan of them, you're going to hate this dish. And there's something about mint in savory meals that just doesn't sit well with me. Make again? Definitely not. If you're trying to be open-minded about the yay-or-nay vegetable called eggplant, this recipe ain't it. I could see this POSSIBLY working served over pasta (and substitute basil for the mint)...so good luck to you if you try! Vegan variation: Omit feta cheese.